This ebook gives unique insight into the cutting-edge technical developments from Honda's worldwide R&D team from April through September 2010. The 30 papers included in this volume chronicle the best of Honda's documented technical advancements in automotive, motorcycle, power products, and other fundamental technologies. Full-color diagrams complement the text. Title highlights include: Styling Design of the CR-Z Styling Design of the VFR1200F Piston Temperature Measurement Technology for Actual HSDI Diesel Engines Development of Bicycle Simulator for Safety Riding Education Enhancement of Low-temperature Combustion in Flexible Fuel Vehicle (FFV) Engine This publication is also conveniently available for purchase in individual chapters. 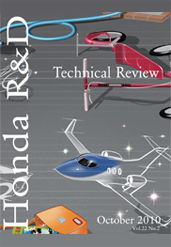 If you do not have access to SAE MOBILUS via username/password or institutional access, you can still purchase the Book, Honda R&D Technical Review: October 2010.